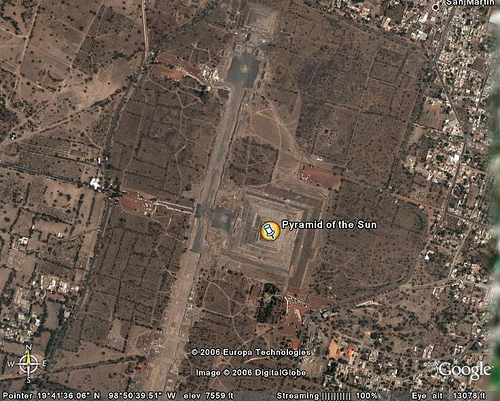 One of the first questions that can be asked, concerning the "pyramid of the Sun", is that of its exact shape. Indeed, the "perfect" shape of Visocica is often stressed by Mr. Osmanagic, and is used as "proof" of its artificial nature (meaning: nature cannot have produced so perfect a shape): see for instance the first paragraph in the document "Naucni argumenti" - "Scientific arguments", published in May 2006 on the Fondation website (it can be downloaded here (bs) ), called "A perfect geometry" (an english version of this "report" can be downloaded there (en)). 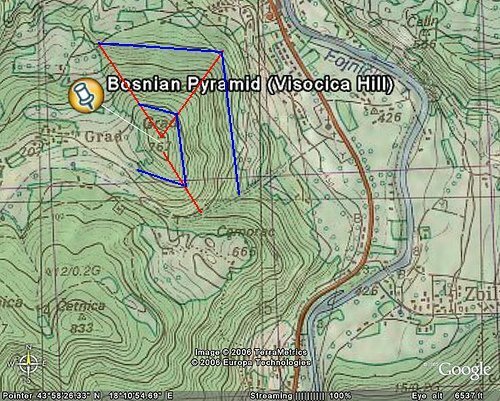 In Mr. Osmanagic’s book (bs) it is said to be a pyramid with four faces oriented toward the cardinal points, this fact being confirmed by a not yet published (but partially used in the document "Naucni argumenti") report by the "Institute of Geodesy of Bosnia and Herzegovina" (of which one member, Mr. Enver Buza, is "adviser" for the Foundation); the same document adds that the North face is oriented "toward the celestial North". 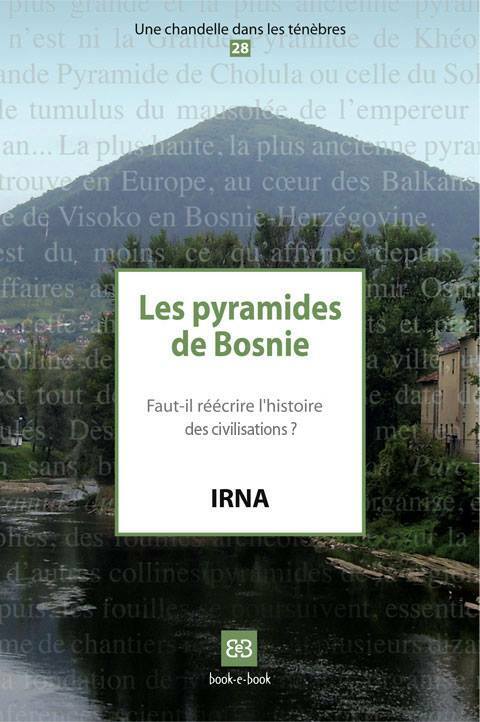 Mr. Osmanagic indeed stresses in his book that "all the other pyramids in the world are equally oriented toward the cardinal points". First comment on these assertions: it is easy to find examples of pyramids not oriented toward the cardinal points. Here is for instance the pyramid of the Sun in Teotihuacan, it’s easy to see that it is not oriented at all toward the North ! On this detailed map, one can notice that the contour-lines on the North face are not perpendicular to the direction of the North, as should be the case if that North face was exactly oriented toward the North. 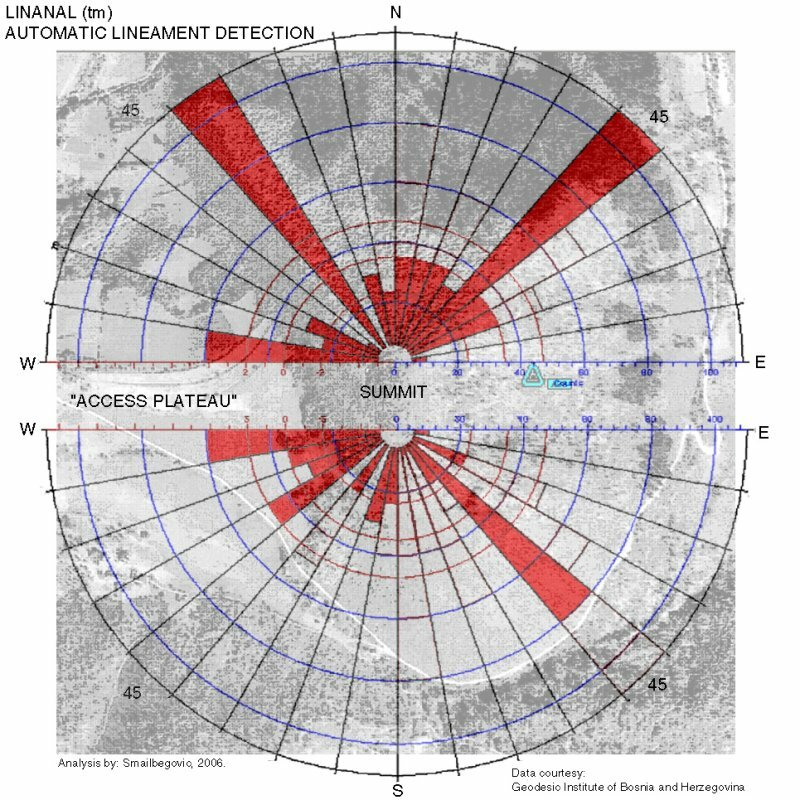 On this second document, it can be seen that the orientation of the most frequent lineaments marking the North-East and North-West angles, as seen by the LINANAL detector, are not symetrical on each side of the North direction: on the North-West they are oriented N35°W, and on the North-East N45°E. I can see at the most three angles, there is no South-West angle on the map. You will object that my reconstitution is debatable, but it is not more debatable than the one suggested by the Foundation! Apart from the North face and the North-West and North-Est angles that are quite clear, the other faces and angles are a lot too dubious for a "perfect geometry" to be used as "evidence" of the pyramid. The size and height of the "pyramid of the Sun" are equally vague. The first news in 2005 mentioned sometimes 70 meters (article from Dnevni Avaz translated on the BBC website (en)), sometimes 100 meters, with a base of 220 x 220 m (AFP news published here (en)). If one looks at the "official" source, the Foundation website, there is again this figure of 220 meters, but this time it is for the height of the pyramid! 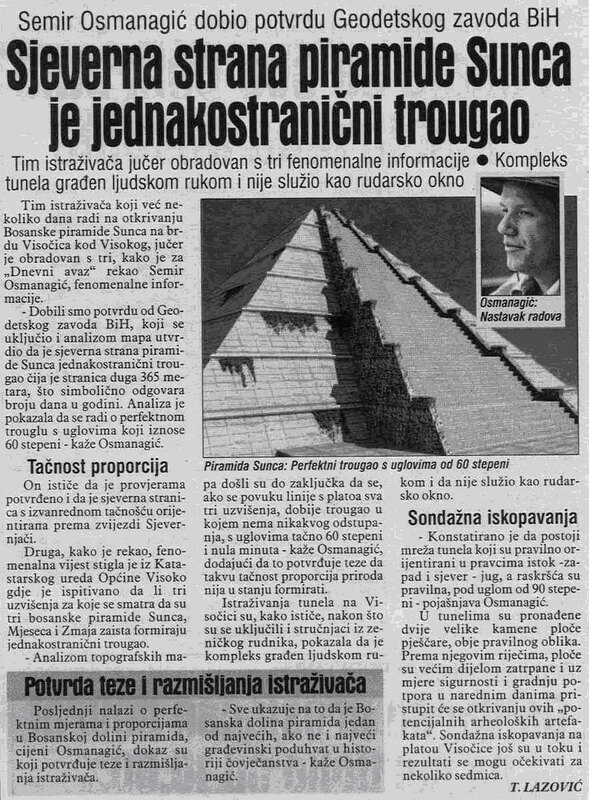 This figure is found in a press release (bs) of 2006, February 25th, on the Bosnian part of the website (with the title "Jedanaest dokaza o postanjanju bosanskih piramida", "Eleven proofs of the existence of the Bosnian pyramids"): "The pyramid of the Sun is 220 m high, that is a third more than the pyramid of Kheops in Egypt". Nowhere is explained how this height has been calculated, nor how the precise altitude of the pyramid base could be determined (a look at the contour lines on the topographic map shows a difference in altitude of at least 250 m between Visocica top and the level of the valley...). If this is correct, as it is elsewhere often said that at least three of the four faces of the pyramid are identical, the base of the pyramid should be a square with sides of 365 m; a simple calculation then shows that the height of the pyramid should equal the half-diagonal of this square, about 257 m, but this figure is again different from every other given by the Foundation. There is again the question of the exact altitude of the base of the pyramid (not to mention the exact place of the angles): for a measurement with a precision of one meter, they had to know exactly where is this base; but these measurements have been made before the beginning of the excavations (and the present excavations, in 2006, take place mostly at mid-height of the pyramid), and, even if there were a pyramid, nobody presently can have the slightest idea of the exact altitude of its base - which could be buried under thick alluvial deposit, or on the contrary be raised on a natural height. 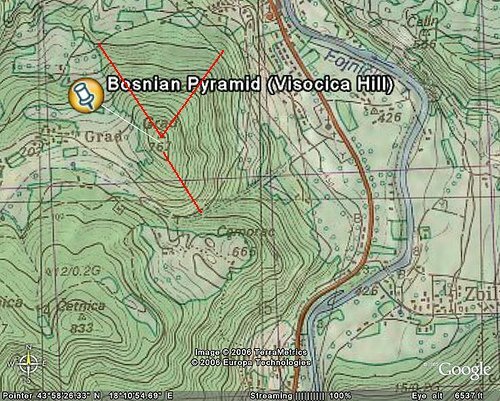 There is a last amusing peculiarity in the document "Scientific arguments": the document uses a picture (picture 7), given by the Institute of Geodesy of Bosnia and Herzegovina, proving, according to the author, the existence of "regular terraces" on Visocica - which is therefore a "step pyramid". 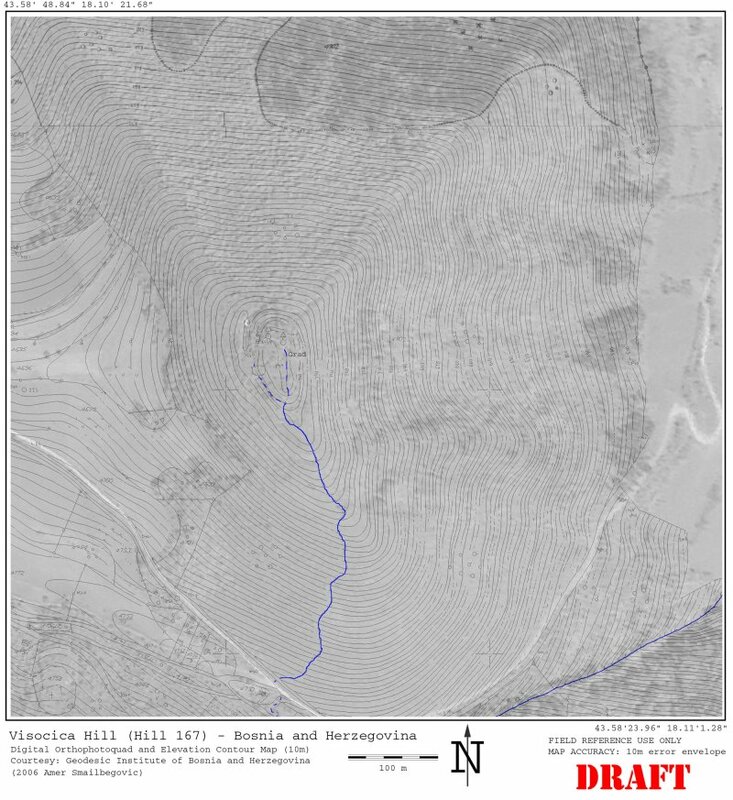 The attentive reader will however notice that all the slopes visible on this picture show the same pattern of terraces; that is not surprising, as this picture is in fact a 3D view constructed discontinuously from the contour lines (that means that there was no attempt to "smooth" the slopes, the relief is constructed in sucessive "slices", each corresponding to an interval between two contour lines); the next picture shows the same view, but this time after a "smoothing" of the slopes, and then, no more terraces! Most of the reports have disappeared from the Foundation site - whether deliberately, or simply by accident, it is not known; so that I join a copy below the article for the interested reader. In fact, Mayas used to consider the Pleiads, more than Polaris, as "fixed point" and reference in the sky, and pyramids in Teotihuacan are oriented toward them. These words "cosmic North" do not refer to a geographical or astronomical notion, but rather to esoterism. 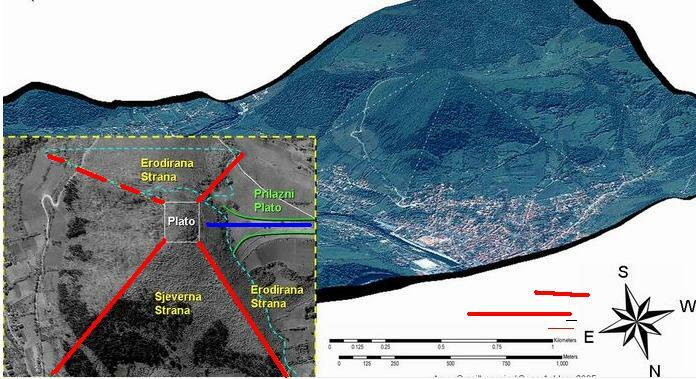 Enver Buza, member of the Institute of Geodesy of Bosnia and Herzegovina, says, for instance here (en), that "the North face of Visocica do not deviate more than 12 mm from the position of Polaris"